I support mostly high school math teachers. I work with colleagues who support K-9 teachers. Last week, I eavesdropped on two of them as they tried to come up with a 3 Act Math Story in style of Dan Meyer that would apply to division 1 students. This week’s Parks and Recreation may have provided us with one. You be the judge. Click on Andy to play the movie. Find out what the students wonder about and what information they will need to answer their questions. I suspect they will wonder whether it will really be a billion nickels. Depending on how young a group you give this to, they may need to know that nickels are worth $0.05 or that there are 20 of them in a dollar. Canadian kids may need to be told that those wacky Americans use paper for $1 instead of coins. The good folks over at Parks and Recreation didn’t film the right answer for us. If anybody wants to withdraw 20 000 nickels, stack them up in some way, film it or photograph it, and send it my way, I would appreciate it. Otherwise, this is the best I can do. Give them a photo and some information. Could Andy hold 20 000 nickels? How much would they weigh? What size container would he need? Would they fit in his trunk? If he piled them all in a giant stack, how high would they reach? What about a billion nickels? How much would they weigh? How high would they reach if all stacked up? Edit (June 16, 2013) The story about Samsung paying off an Apple lawsuit using truckloads of nickels is a really nice sequel to this one. Some conversation on Twitter last night led me back here and I realized I never updated the sequels to include links to it. I have been using screenshots of this site, which I believe this is the origin of the story. The Humor>Satire also clearly indicates it’s a fake story. Timon Piccini sent links to this story last night, which isn’t as obviously fake. This morning, while updating, I found the following YouTube video purporting to be the 30 trucks delivering the nickels. I’m no world traveler, but it looks awfully European to me. It still might be fun to run it by a class full of kids. Used this today! My kids LOVED it. 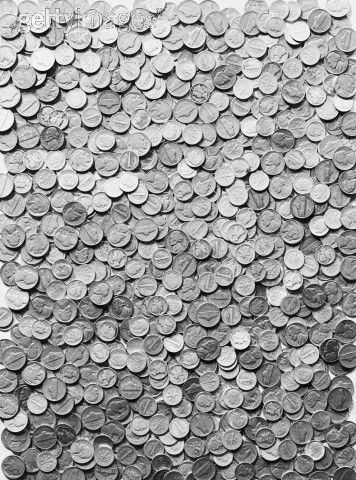 I had them take estimates of how big 20,000 nickels would be… then when we found out 20,000 nickels is really not that impressive either, we talked about what a billion would look like. Students immediately asked “would it fit in this room?” I couldn’t have asked for a better segue.